excellent book and highly recommended. the young Winston in the Boer war. describes all his youthful foolishness, courage, overweening self-esteem, class arrogance, his strength and undaunted bravery. He endured prison camp (not terribly onerous) firefights, escape from prison camp, hid out in the depths of a mine, walked endless miles on his escape route — escape from the Boers — and ate dreadful stuff. He was carried forward by an amazing self-confidence, even narcissism of a sort. and that’s often what it takes to be the leader he later became. it is silly to demand that leaders of this caliber also be humble and sympathetic etc. it is not possible. Candice Millard did terrific research and her writing is first rate. Very objective. 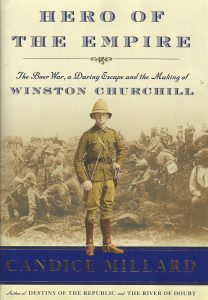 This led me to reading more about the Boer War, especially the book Commando, by Denys Reitz. I met her at the Express-News charity event November 11th, which was to raise money for cancer research. I was never so close to being non-functional as at that event. I just had not recovered from my fall and broken arm, was there in a cast, and really did not know if I could stand up before 500 people and speak but I made it. I should not have gone. It was very hard to sign books and be polite to people. That cast prevented me from sleeping well at night, prevented rest. At any rate I met Candice and we exchanged books. 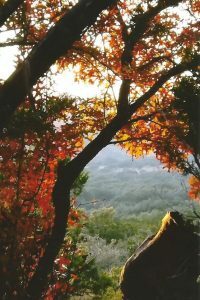 We have good color this fall, the Spanish oaks are turning very red. Beautiful!